Knowing what you need to do isn’t enough; you need to know what to do next. When you’re juggling 1,000 competing demands all at once, you need a tool that shows you at a glance what’s up next so you can keep your work moving forward. Outlook has several task management tools that help you organize your lengthy to-do list for peak performance. Those tools include the Tasks module, the To-Do list, and the To-Do bar. Here’s a quick way to get started in a jiffy. Click Tasks in the Navigation bar to switch to the Tasks module if needed. On the Home tab of the Ribbon in the Current View group, click Simple List to make sure the Task list is in Simple List view. You can create new tasks from any view, but the wording of the next step is slightly different depending on what view you are in, so Step 2 is just to help you avoid any confusion as you are getting started with Outlook. Click in the Click Here to Add a New Task Box and type the name of your task. Remember in the previous step when I said the wording was a little different? In some of the views, the wording is Type a New Task, and in other views the box for adding a new task this way isn’t present at all. That’s why I had you start out in Simple List view in Step 2, to avoid that mess. You’re welcome. Press Enter. 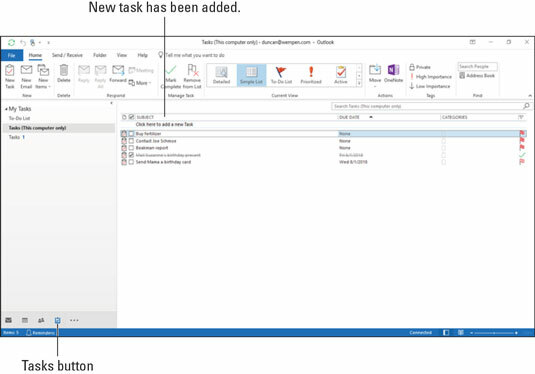 Your new task moves down to the Task list with your other tasks, as shown here. Entering your task in the Task list. Outlook can help you manage anything from a simple shopping list to a complex business project.